From the Pamlico Sound 2013 in the town of Buxton. Last edited by parallax; 10-11-2018 at 06:07 AM. Never seen one with that light of a color pattern before. Have seen one that was dark & light green. Most of the ones I see have dark brown or black patterns. I've seen new born Cotton Mouths that color. But I have not seen one that light that was near that size. Agreed with the light color pattern. It might be from the brackish water it lives in. Mocassins float on the water top, water snakes don't (for thread viewers who need help ID'ing them in the wild). Didn't know that. Thanks for the info! 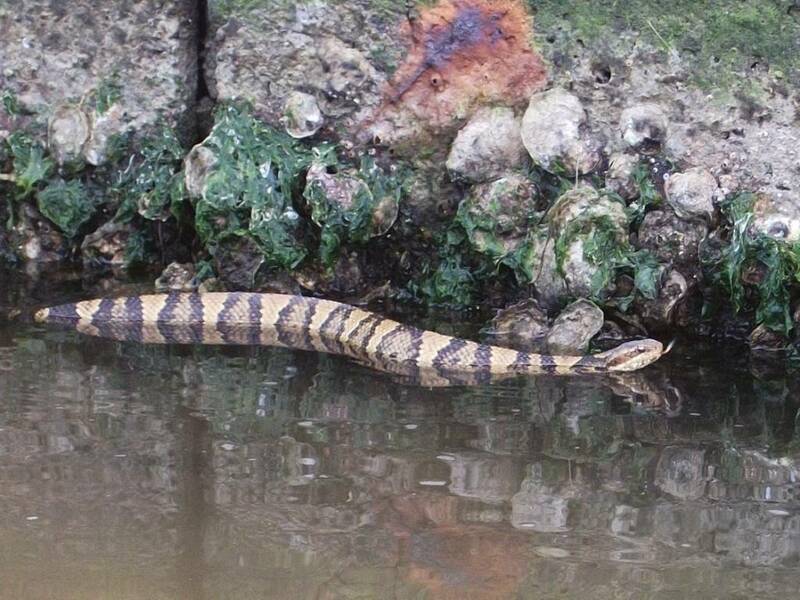 Oh, by the way...I mentioned it in a previous post years ago that this snake when I first approached it in the kayak, it coiled up while floating on the water. I just didn't get a shot of it doing so but I thought that was very interesting. I've seen them do that. I was wading past a log, and spooked a Cottonmouth that was coiled up on the log. It jumped into the water and coiled back up, mouth open, and just floated there. I was scouting a shorter route into a swamp stand, and after I seen two more Cottonmouths after that first one...I decided I'd come in by the longer route...and not risk coming out the shorter route in the dark. I couldn’t hunt around snakes like that!